As a developer, have you ever wanted to banish your fears of hard disk failure and stupid mistakes in one easy step? Did you ever consider that using a hosted version control system could do just that? It’s long been established that using a version control system is A Good Thing for software quality and developer productivity. Joel on Software goes as far as claiming it as the very first step on the path to writing good code. Fortunately I’ve never been employed by someone using that last “technique”! I’ve never met an unsatisfied Perforce user but it has historically been an expensive proposition and rarely adopted in companies without a tenacious technical leader. The cost typically requires a lead who can convince the bean counters of the value of a good software system. CVS experienced a phenomenal amount of growth and popularity with the rise of Open Source software in the late nineties. It was the tool of choice for many large free software projects. However, its command-line roots make for some terrible user interfaces and have dragged its reputation through the mud on Windows. Sourcesafe is a legacy tool. Even if you’re a fan of it, there’s no denying some of its shortcomings; poor command-line support (for automating builds), only available on a 0single platform, problems with corruption (due to its underlying file-sharing architecture), a pain when branching any sizeable project. Sourcesafe has a big following because of its relatively simple user interface and the fact it comes bundled with Visual Studio. The systems I’ve described above are all looking a bit long in the tooth for modern, “web 2.0” development shops. Wouldn’t it be great if there was a superior product that combined the best of all worlds? Subversion is meant to be the answer to all our prayers. It has a range of user interfaces that are much easier to use than WinCVS, it integrates into existing IDE products, its command-line support is fantastic and it has a similar changeset model of version control to Perforce. And it’s free. However, it’s a pig to set up and configure unless you’re familiar with installing and configuring Apache 2.0. Beanstalk takes subversion and makes it effortless. As a hosted solution, Beanstalk requires virtually no installation on your own machine. The only thing you have to do is upload any code you’ve already written that you want to use with the system. You can look at your code from anywhere on the planet, even if you forgot your laptop. Having a version control system in place can also change your entire approach to coding, boosting your productivity. Instead of sitting down to your IDE and looking for things to improve, new features to work on or bits to tweak, your focus becomes much more task-oriented. All the changes you make are aiming towards the next commit. Integrates with other tools that are very helpful and productive for small (or one-man) software developers such as Basecamp and Lighthouse. If you are in the mood to just mess around with your code, you’ve got the comfort of And finally, if you’re a real control freak, you can even log in to Beanstalk from your iPhone and check on the progress of any pending commits. All these features show the passion the developers have, so why not go ahead and see if I’m right and sign up for free? Are you using some other must-have hosted service that helps you be more productive as a software developer? Share your experience in the comments below. Disclaimer: I do not own stock in Beanstalk, I’m just a big fan of their service. If you’re not even sure about what version control really is, check out this superb visual guide. This entry was posted in General and tagged hosted solution, subversion, version control, web 2.0. Bookmark the permalink. We built Beanstalk for the exact reasons you stated above. I am mainly the tech/design lead at Wildbit (parent company to Beanstalk). When it came to adding users or repositories it was such a pain. I knew how to do it, but logging into ssh and changing configs was far from convenient. 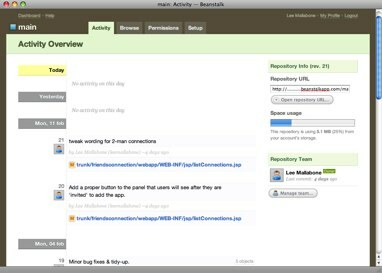 We also lacked a good UI to track activity and collaborate (WebSVN is awful). These pains helped us build on the idea of Beanstalk, and eventually design and implement the system. I’m glad you like it. Feel free to give us feedback or feature ideas so we can improve the service.